Here are top 18 objective type sample C & Data Structure Interview questions and their answers are given just below to them. These sample questions are framed by experts from Intellipaat who trains for Online C Classes Training to give you an idea of type of questions which may be asked in interview. We have taken full care to give correct answers for all the questions. Do comment your thoughts Happy Job Hunting! 1. What are different techniques for making hash function? 2. What are the issues that hamper the efficiency in sorting a file? 3. What is the use of volatile keyword? Go through this C Programming tutorial, to check more programmes in C.
5. What are differences between sizeof operator and strlen function? Read C programming tutorial to learn about various operators in C.
7. When does the compiler not implicitly generate the address of the first element of an array? Get a clear understanding of C Array in this engrossing C tutorial. 8. Is using exit() the same as using return? Become C & Data Structure Certified in 16 hrs. 9. What is an lvalue? 10. What is the difference between goto, longjmp() and setjmp()? Know more about C Functions in this riveting tutorial. 11. What is XOR linked list? 12. What is ‘trie’ in data structure? 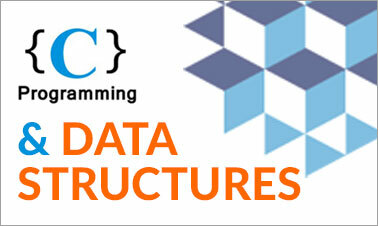 Become Master of C & Data Structure by going through this online training course. 13. What do you understand by splay tree? Go through this C Video to get clear understanding of C Programming. –>Each node of Treap maintains two values. 15. How to implement LRU caching scheme? What data structures should be used? –>We use two data structures to implement an LRU Cache. 16. Suppose, there are two linked lists: L1 and L2 (of same lengths) that intersect at a particular node N1, which is a common endpoint to all other nodes. What are the possibilities to find N1? 17. Given two keys K1 & K2, write an algorithm to print all the elements between them with K1<=K2 in a BST. 18. How many stacks are required to implement a Queue. For Enqueue: Take two stacks S1 and S2 and perform push on S1. For Dequeue: If S2 is empty, pop all the elements from S1 and push it to S2. The last element you popped from S1 is an element to be dequeued. If S2 is not empty, then pop the top element in it. 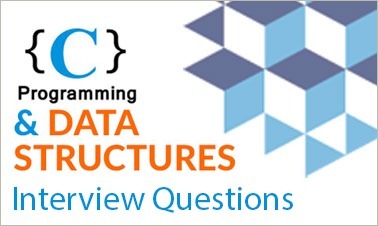 "2 Responses on Top C & Data Structure Interview Questions And Answers"
Sign Up or Login to view the Free Top C & Data Structure Interview Questions And Answers.